this is a nice little gem of a website... lots of useful tips and tricks that make me fall asleep. This what your Make Me Sleepy Blog Ad will look like to visitors! Of course you will want to use keywords and ad targeting to get the most out of your ad campaign! So purchase an ad space today before there all gone! Sleep hypnosis could help relieve you of your anxiety and tension People report falling asleep within minutes when listening to sleep hypnosis Being able to put yourself in a relaxed state could literally change your life Try this video from Michael Sealey now! 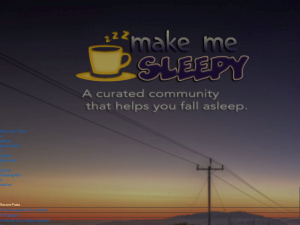 If you are the owner of Make Me Sleepy, or someone who enjoys this blog why not upgrade it to a Featured Listing or Permanent Listing?